Let me keep you forever. I hate that I almost keep losing you. You make me the happiest person in the world. I want to be different. I don’t want to be scared anymore, when I’m with you I don’t feel scared. I feel safe, I feel your love, I realize that you do want to be with me forever. Losing you is like losing something special to you when you were little. It’s like killing your only happiness. I’ll do anything for you, I’ll do anything to be with you. For me to change you have to be strong for me. You have to stay by my side. I don’t want to lose the love of my life. You’ve helped me accomplish so much. You’ve let me release my true feelings and you accept it. I need to be with you, I need to stay with my one and only. You mend my heart from being broken, you’re different from all the rest, you actually care. you actually want to be with you. I don’t remember ever feeling this way with another guy. You walked into my life and I was blinded by love at first sight, I didn’t even realize it. Then after a while I started talking to you and I released what was locked away. I let out all my feelings, I let out my happiness, I let out all my love. To one person and one person alone. You. My true love was locked up, afraid of being hurt over and over again, but I couldn’t stop it from coming out when we started talking. It had a mind of its own. All of a sudden I wanted to know you more, I wanted to kiss you, I wanted to be in your arms. You made me feel alive all over again. You made me smile. Then when we went out on our first date, it was the happiest I’ve been since a long time. I kept wanting to kiss you, I kept wanting to be in your arms. I got attached and didn’t want to let go. You’ve made me grow from what I used to be. You’ve shown my heart how to love again, you’ve shown me how to be happy again in someone’s arms. You’ve shown me so many new things that I wouldn’t be able to do before. You show me that there is someone out there that wants to be with me as much as I want to be with them. I’ve found my one and only. I’ve found you. I love you with all my heart and so much more. I love you with my soul. I believe we were meant to be together. I believe we’re soul mates. I believe I can change with your help. Your everything to me Dylan. Your my stars and moon. You light up my night. You lead my way to happiness. And when I get there, you’re there. To take me hand and hold me in a warm, loving, caring hug. Your smile, your voice, your love: it means the world to me. I don’t ever want to lose this feeling I have with you. I believe it’s true love. You are my true love Dylan. Tell me how you’d feel if you lost me. Tell me how you would feel if I disappeared. Remind me how important I am to you. The dress in my opinion is really cute. I loved it when I first saw it. When I tried it on it looked really good. Then after a while of looking at myself in the mirror with it on I kind of look bigger in it, but oh well I still look cute in it. I walked around in them to break them in, apparently they broke me in. >.< They pretty much cut my ankle, the back of it of course. The problem I have in these shoes is that I don’t know how to walk in them =/ I’m used to wearing sandals and whenever I walk in these shoes my feet clench onto the shoes, that I’ll need to fix. But the one I got was smaller and black. The arms didn’t go that far down, but hey that’s just an example. Well I got home and tried it all on and it was very cute. 🙂 I’m excited to wear it. Thanx for reading my long awaited post. Hope you check in regularly. I don’t really listen to them, but this has always been a song that I like listening to. It shows to me that I’m never alone. Like it makes me think a lot and it makes me feel that way. Yes, I do love this song. I always have and I want someone to become my escape from pain, I want to be able to love myself and I want to be able to not be afraid of anything. Sometimes I feel locked up in a dark lonely place with no way out, as if no one can help me. I have no idea what this song means 😛 but it’s kind of an addicting song and I like it a lot. It’s another song by Mandy Moore and yes its another song from the movie, A Walk to Remember. This song is like a love song. To me it shows a love that’s just starting to develop and grow stronger. Talking about a true love kind of thing. Not sure how to explain it, but I kind of relate to this song. Oh yeah the music video has spoilers. The moon and stars are one of my most favorite things in this world. They’re so bright and beautiful, especially when there’s a lot of them. When I see them I feel full of life, and I get relaxed. My favorite kind of moon is a Full Moon. I believe that the Moon and stars are a romantic symbol not only a dream symbol. Especially when two people so in love with each other are far away from each other. When that happens they can both stare up at the moon while talking on the phone and realize that even though they’re far away from each other, they’re still under the same sky. Even if one person can already see the moon, the other person should try as hard as they can to find it, no matter what. If it means going outside, go outside. If it means going in a different room, do that. Sure it might not be the same side of the moon, but it’s still the same moon. I’ve always loved the Moon and stars. I could stare at them forever. I hope that one day my true love will kiss me on a hilltop under the stars. 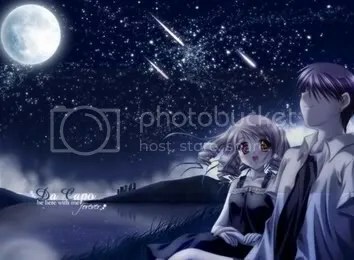 For some reason I believe that the Moon and Stars can bring two people a long, happy, and loving relationship. The Moon and Stars will always be a romantic symbol too in my eyes. Sorry guys, I haven’t been on here in a very long time. I’ve been very busy with my vacation and stuff that I haven’t had time. I guess I’ll try to write something new every week. Like explain what I did in that week etc. So let me give you some information. I’m in Las Vegas right now, California was fun. I bought some interesting things. I’m keeping a long travel blog on my laptop which i prefer not to rewrite on here. So I’m just going to put that blog up when I go back to Indiana. It’s going to include my plane ride from Chicago to Las Vegas from Las Vegas to Orange County. Then it’ll include my travel from Las Vegas to Chicago. Well I got here on Saturday and boy was that a long drive. I felt sick after finally getting there. We went through different places with different temperatures. I finally got there and it seemed really dull at the time. Everyone was sitting and talking n i just wanted to go upstairs and rest. Call Dylan and sleep 😛 but no I couldn’t do that. After a while I think I unpacked and did stay upstairs. Then next day after that my dad took me to the library and then everyone went to see The Proposal. It was a predictable movie, but it was still really good and really funny. Ever since my arrival in Las Vegas i was having a rough time. I wanted to go home earlier then i was suppose to but i didn’t know how to talk to my dad about it and I didn’t want to hurt his feelings cuz I love my dad. So from the depressing time, it all caused me to cry exactly every single night since I got to Vegas. On Sunday I think my dad and I went to the Swap meat…got nothing really XD Then we went back home and did something i don’t remember. I think we played Skip-Bo. On Monday I think it was a pretty chill day, don’t remember much on that day either. Got my pillow fabric, etc. On Tuesday we went to Broadway Pizza for the last dinner with my step mom’s parents. They came to visit and went home on Wednesday. Which on Wednesday I watched DVDs, played card games. Then Thursday I started my pillow, its no where to being finished. I went over to my friend’s house and spent two nights over there. The first night we watched a movie and went swimming at night. It’s like a tradition for us. I talked on the phone and went on the computer, it was fun. Then we fell asleep while watching many episodes of Invader Zim. I swear I heard all the episodes in my dream XD. On Friday we watched Friday the 13th then went to a park to play volleyball. My body was in so much pain and still is. I had this mega huge headache which seems to be gone now. Then today, Saturday, my friend and I went to her volleyball tournament. Even thought they lost, they still played really well and it was a close game. After that I was dropped off at my dad’s house. Where we played May I, then my dad took me to the library where I got two large bag fulls of books and DVDs. Then we went shopping around in cell phone stores then went to my grandma’s house to find out she’s not there. Which all brings us to now when I should be eating Dinner. So I’ll try to write back soon. Sorry that I haven’t written in a while. Ttyl. Well it’s not really another virus, it’s the same virus. And i highly doubt it ever left my computer. My laptop is having a One Care scanning day. Hopefully it fixes things so that I can at least open up documents and write by hand what the documents say. There’s like 5 documents that I really care about. The pictures are another thing that I might have to lose. 😦 I have a whole album with pictures of me and Dylan and only like 7 of those might be saved because my mom put some on her laptop. So those might be saved, but idk about the other ones. Plus the pictures from the last day of school with all my friends. That’s a bummer. I hate viruses. I don’t understand why people make those, can’t they just leave us alone. I don’t think I got this virus from anywhere particular. My mom thinks I got it from this game I downloaded recently, but I really don’t know. =/ It just showed up randomly when I was viewing websites that I usually always go on. I really want to watch some anime right now on Crunchyroll, but last night I was on that website and that’s when it came on, but I know the virus didn’t come from there, because I’ve been going on crunchyroll for the past like 2 years and it’s never given me a problem. Throughout the year I’ve created many quotes. These quotes helped me get through the school year, especially on the days I was upset. I warn you this is going to be a long post, but it’s all worth it. You’ll notice most of them are sad, because I started writing quotes while going through my break-up. Then you’ll notice how the quotes start to stop when I became happy again. You’re probably going to wonder how these quotes helped me get through the year. They helped the days go by faster, and they helped me let my feelings out. Finally, it’s done!!! XD Hope you enjoyed, I’m not going to put a picture or music video up. Basically because it will make it longer and you guys don’t need that. Butterflynight's Blog syndicates its weblog posts and Comments using a technology called RSS (Real Simple Syndication). You can use a service like Bloglines to get notified when there are new posts to this weblog.